Ballycastle means 'Town of the Castle' and is situated on the north-east coast of Ireland where the Atlantic Ocean meets the Irish Sea. (Sea of Moyle). It has a growing population of around 5'800 people. 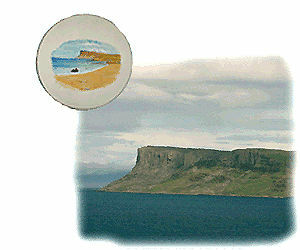 The 600 foot cliffs of Fairhead rise like a wall to separate two completely different regions on Ballycastle's doorstep. Namely the famous Causeway Coast (on the Atlantic Ocean ) and the mountains of Knocklayde, (1,695 feet) rising symmetrically behind the resort and beyond it are the sheltered Nine Glens of Antrim: Glencloy, Glenariff, Glenaan, Glencorp, Glendun, Glenballyeamon, Glenarm, Glenshesk and Glentaisie. These areas are renowned for their natural heritage and are designated as Areas of Outstanding Natural Beauty. On a fine day the Scottish Mull of Kintyre and Bute are sharp and only 14 miles from Fairhead. Ballycastle plays a host to countless festivals, particularly traditional Irish music and dancing, like the Ballycastle Fleadh. On such occasions you'll find music and dancing on the streets and a 'session' in every pub. Ballycastle is also home to the historic Ould Lammas Fair which dates back to the 17th century. It is held annually on the last Monday and Tuesday in August and features everything from horse trading to hundreds of stalls at which you can buy the local specialties of 'dulse' (an edible seaweed) and 'yellow man' (a hard, yellow sticky toffee). It attracts approximatley 150,000 people who come to meet up with friends and family, some of whom they only see at the Fair on a yearly basis. At night there is Irish music and dancing in the streets, halls and pubs. 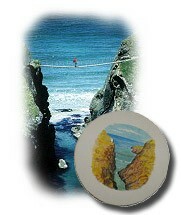 Ballycastle is a town which is enjoyed by its residents and visitors alike. The quality of life and welcoming inclusive community is key to the success of the town, it is cherished and never taken for granted by the local residents.